Barcud Trail at Bwlch Nant Yr Arian Visitor Centre (NRW)0300 065 3000work Walking RouteThe Barcud Trail and Animal Puzzle Trail (two thirds of a mile, 1.2 kilometres). 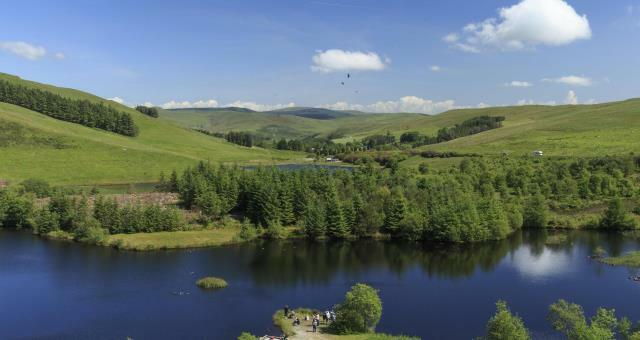 The Barcud Trail leads you around the edge of the lake where the daily feeding of the red kites takes place (the Welsh for red kite is “Barcud Coch”). It is suitable for wheelchairs. Along the route there are wooden animals to spot - pick up an animal puzzle trail leaflet from the visitor centre. The Barcud Trail and Animal Puzzle Trail (two thirds of a mile, 1.2 kilometres). The trail is graded as all ability throughout with a gradient of less than 10%. The surface is generally smooth.